Have you ever wanted to walk around downtown in the winter time styled like our favorite hero? Thanks to Etsy.com you now can! The picture to the right is one of several color choices and styles. They have everything from the classic hat to more colorful options. The costs of these hats is fairly decent, 25$ USD plus shipping and handling. 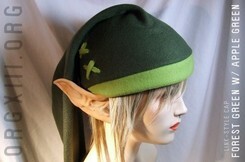 Along with the Link hats they also offer a Kingdom Hearts styled hat for 27$ USD. What are you waiting for? Check out the hat listings here! Our confidential style experts tell us that Link hats will surely be all the rage this winter. Don’t let yourself be seen without one.